In "the first of a two-part world exclusive interview" with the Daily Mail, Barbara Winfrey is telling all about her former husband Vernon's daughter. The dirt ranges from allegations that Oprah is snotty about what kind of towels she uses to claims that she encouraged a rift between Barbara and Vernon to comments about her relationships with Gayle and Stedman. Barbara wasn't pleased with her eviction, hence the "two-part world exclusive interview" with the Daily Mail (selling her story was a direction she intimated she might take in early April). In the first part of the interview, Barbara throws down a slew of allegations, some that we've heard before. For instance: that Oprah and Stedman are not really in love but have a relationship based on power; that Oprah didn't want to go to Barbara and Vernon's wedding and always disliked Barbara; that Oprah gets Gayle to fire people for her; that Oprah is bossy and demanding and holds all the power in her relationships; that Barbara and Vernon were often put up in hotels when they went to visit Oprah, despite the fact that she lives in palatial mansions; that the pair were excluded from mingling with celebrities during her Legend's Ball; and that Oprah doesn't want to do a DNA test to see if Vernon is truly her father (it's been rumored he's not) because she doesn't want the proof that they could truly be related because he's not classy enough for her. Woof. She describes Oprah's relationship with close confidante Gayle King, 59, as 'bizarre' and 'unhealthy,' and points to it as the reason that neither woman is married. 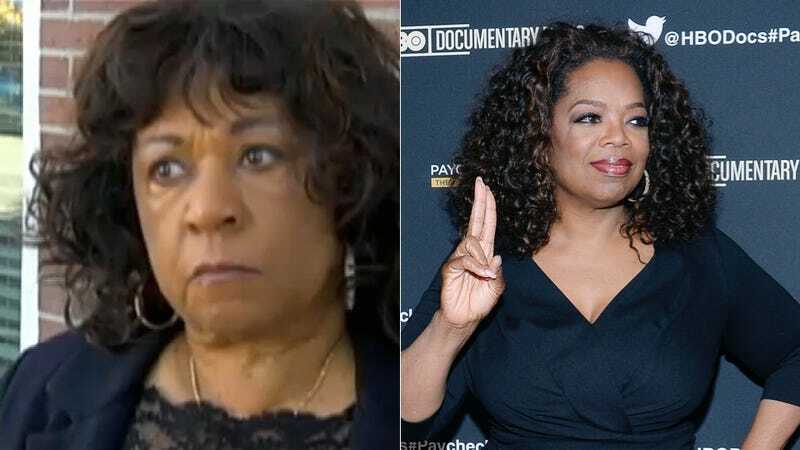 And when she and Vernon arrived at Oprah's Chicago condo on one occasion she recalled, 'Oprah got on the intercom and announced, "Negroes in the house. Negroes in the house." "Oprah is a woman who empowers women to be all they can be, to stand up against men who mistreat them," Barbara told the Daily Mail. "If she was a more decent person she would realize that what her dad did was very wrong instead of plotting against me and pushing me out of the scene." If this is part one, what have they saved for part two?